Passive solar design is based on several general interwoven scientific principles. 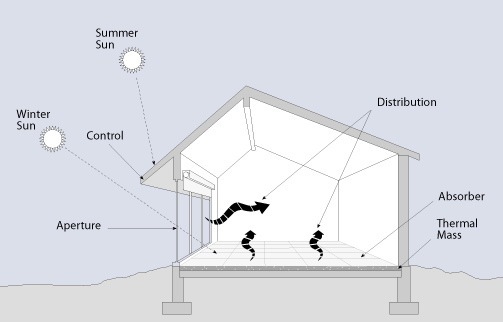 Because passive solar heating and cooling relies upon the predictable movements of the sun, it warrants basic understanding of how it moves in relation to your position on the earth. The sun’s heat energy also needs to be understood on a basic level because the sun’s heat is the principle source of heat in passive solar design. The sun’s heat energy can be harnessed as well as redirected or blocked. Building materials that can absorb, store and radiate heat are instrumental and necessary in passive solar building design and its overall success. The following pages have more in-depth information on these subjects on their respective pages.